Liverpool School of Cookery Welcome Guest Pudding - 4 oz Bread Crumbs 3 oz ratafia biscuits 1/2 pint milk 3 eggs 3 oz suet 2 oz Lemon or Citron peel 3 oz of Raw sugar grated rind of one Lemon Rub 3 oz of Bread Crumbs through a wire sieve. put them in a good sized bowl, pour over them 1/2 pint of boiling milk, stir with a wooden spoon to mix the milk thoroughly. Get ready 2 oz Ratafia Biscuits & 1 oz Bread Crumbs stir these into the steeped crumbs, chop up as far as possible 3 oz suet & 2 oz Lemon Peel stir in with 3 oz Raw sugar and the grated rind of a Lemon. When all these are thoroughly mixed break in one by one 3 eggs stir well between each egg. Oil a mould well, pour in the Pudding and steam for 2 hours. Serve with wine sauce. For extra occasions decorate the mould with raisins or dried cherries. 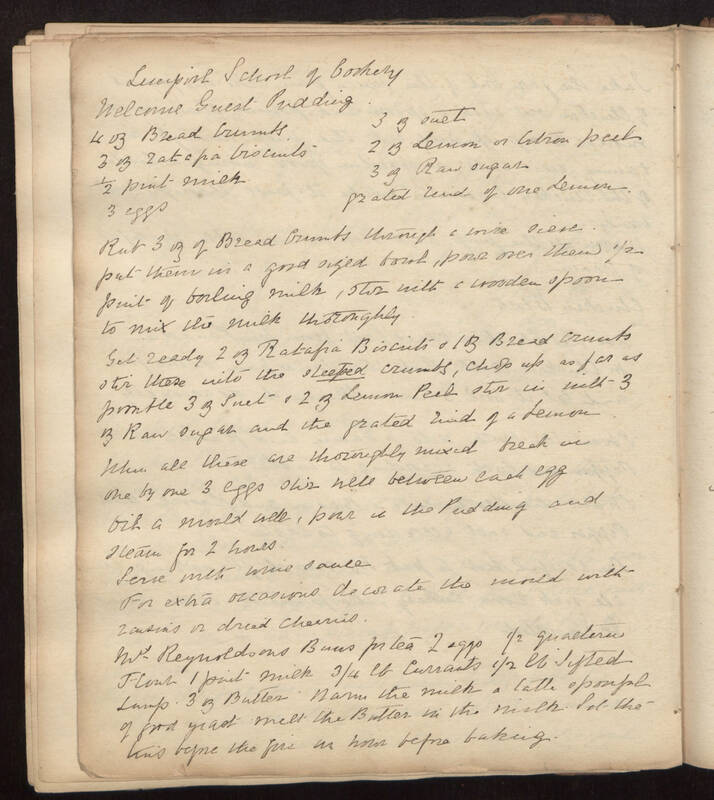 Mrs Reynoldsons Buns for tea - 2 eggs 1/2 quarterns Flour 1 pint milk 3/4 lb Currants 1/2 lb Sifted Lump 3 oz Butter Warm the milk a table spoonful of good yeast melt the Butter in the milk let Set the tins before the fire an hour before baking.